A hackathon that aimed to find new ways to get information in, out and around North Korea took place over the weekend in San Francisco. The event, called “Hack North Korea,” was organized by New York-based charity Human Rights Foundation and brought together programmers, human rights campaigners and defectors. Several teams spent the weekend working on ideas that would enable digital information to be concealed, hidden or otherwise transmitted without raising the suspicion of authorities. The ideas ran from the low-tech, using a catapult to fling things across the Yalu River that divides North Korea and China, to the high-tech, involving satellites, stenography and information hidden so a random check wouldn’t reveal it. The weekend kicked off with speeches from four North Korean defectors who had made the trip from Seoul to attend the event. They included Park Yeon Mi, best known for her appearances on the South Korean TV show “New On My Way To Meet You,” who spoke of how watching a smuggled copy of the movie “Titanic” spurred her to make the long journey most defectors must make from North Korea through China to South Korea. Park Sang Hak, chairman of Fighters for a Free North Korea, spoke about his program to send leaflets into North Korea via balloon. Park’s organization regularly releases balloons carrying large bags full of propaganda leaflets, DVDs, USB sticks, radios and other items from a point near the inter-Korean border. The bags are timed to release their contents after a certain period of time over North Korean soil and Park sent around 4- to 5-million last year, he said. 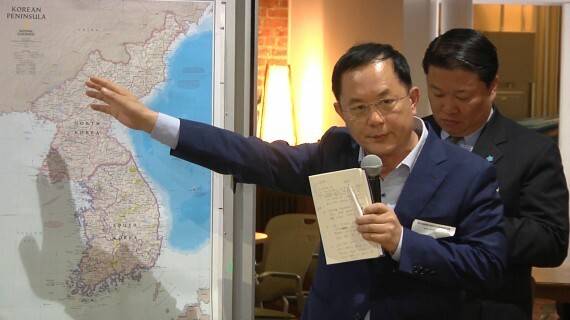 Choi Song Il, a former North Korean dentist, joined the North Korean Strategy Center upon his arrival in South Korea and still conducts activities along the Chinese border today, helping research the current state of North Korea through talks with defectors that have made it out of the country. And Kim Heung Kwang (??? ), a former professor at Pyongyang Computer Technology University and executive director of North Korea Intellectual Solidarity, spoke about the importance of foreign information in the country and how it could educate people and help the free thinking of individuals. Kim Heung Kwang of the North Korean Intellectuals Society, speaks at the “Hack North Korea” event in San Francisco on August 2, 2014. The hackathon saw several groups contend for a prize of two round-trip air tickets to Seoul to further their work with defector groups. The Human Rights Foundation also said it would assist in realizing the top proposal. The winner was a group that proposed using small, commercial satellite antennas to bring Skylife TV to North Korea. Skylife is a subscription satellite TV service offering around 100 channels of news, entertainment, sports and other programming. The group proposed using compact flat antennas and supposed that the service would be unlikely to be jammed because it would first penetrate the homes of elites and they wouldn’t want to lose service. 2 Comments on "“Hack North Korea” focuses Silicon Valley on information flow"